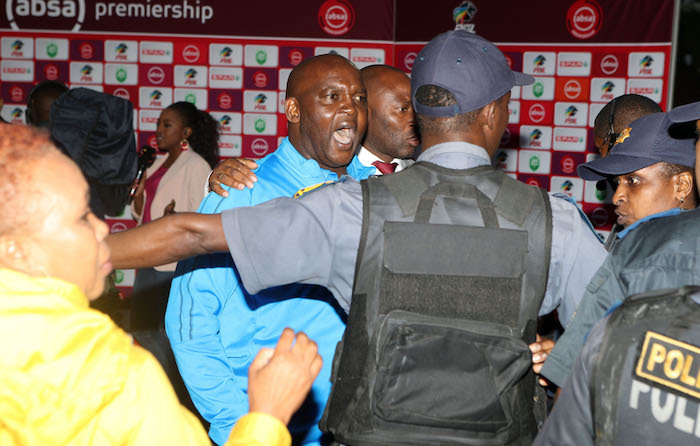 Mamelodi Sundowns coach Pitso Mosimane will appear before Premier Soccer League’s Disciplinary Committee following a reported altercation with a security official after their Absa Premiership clash against AmaZulu. Phakamani Mahlambi marked his first appearance for Masandawana with a goal against Usuthu as the two teams played to a 3-3 draw on 16 September, however the clash was marred by a post-match incident which saw Mosimane being involved in a scuffle. It is said that a fan forced his way onto the field of play at the King Zwelithini Stadium after the clash, at which point the former Bafana Bafana mentor intervened, leading to a scuffle between the security guard and Mosimane. ‘I was called by the DC, it’s an assault. Against Barcelona, a supporter came in,’ he is quoted as saying by kickoff. ‘You were there, what did I do? I hugged him, I ushered him out. It’s not the first time I usher them out. That’s what happened in Durban. It’s an assault. ‘Where is the human part of football? Can I show that against the other team? I saw another coach in Maritzburg United’s Mandla Ncikazi, a good friend. He did this [points a finger] to [Ernst] Middendorp. ‘Remember that case? How long did it take? It took a year. He did this to the referee live on TV. If I do that it’s a life sentence,’ he concluded.